﻿Business Level 3 Unit 3 ? P3/M3 Unit 3 P3 ? Section 1 Marketing Research Marketing research is when you research the market so you can get information about other businesses around the area, the marketing research includes things like what the product is what it?s for and how they are presented, Marketing research is also researching what types of products are good, and in which area?s they will sell well, Marketing research is basically getting data of other business in the same area or same type of business as yours. 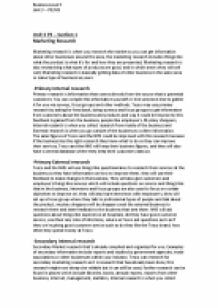 -Primary Internal research Primary research is Information that comes directly from the source that is potential customers. You can compile this information yourself or hire someone else to gather it for you via surveys, focus groups and other methods. Tesco may use primary research by asking for feed back, doing surveys and focus groups to get information from customers about the business and products and way it could be improved, this feedback is gained from the business, people like employee?s, Mystery shoppers, Internal research is when you collect research from inside of the business and External research is when you go outside of the business to collect information. The sales figures of Tesco and the NHS could be improved with this research because if the business has the right research they know what to do so they can improve their services, Tesco and the NHS will keep their business figures, and they will also have a central database where they keep their customers data on. ...read more. will have big groups to test out new products within the NHS for example if a new piece of machinery came out a focus group would have to be put in place to focus on that piece of machinery and test it before it is used in the hospitals, they have focus groups for any new product they release or want to bring into use. -Qualitative Tesco Tesco will have focus groups for new products they will be releasing in their store, Such as the Iphone grocery application, it would have had a focus group to discuss the product, things like reasonable prices, features and how people would use them, For a example before Tesco released their Iphone grocery application it must have gone through a focus group that must have tested it and found ways to improve on it, when the focus group thought the product was good to be released they would release it for use in the store, they will ask open questions to try to get as much information on what people think of the product before releasing it, the focus groups allow the business to understand what people thing about their prices, Their products, what to change, customer preferences, opinions, interests, the Focus groups help Tesco with finding out what the business thinks of their product. 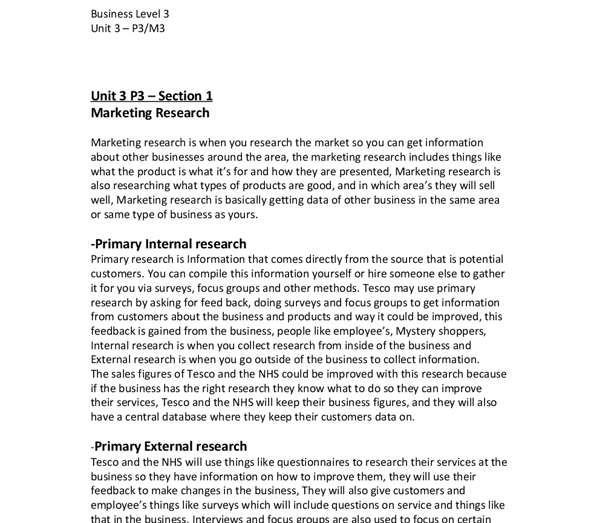 M3 Limitations -Costs Market research can become very expensive because there are many methods as businesses take part in primary and secondary research on a regular basis, companies such as Tesco and NHS will spend millions of pounds on their market research to find out exactly what people want and need in their products. ...read more. research given and the business will loose out, Tesco and the NHS must make sure that their research is analyzed correctly so they can make valid changes of things the people actually want to see in the business, not a mistake in the research, Tesco and the NHS must also make sure their questions offer consistency so the responses will be a good quality, high detailed and reliable answers, they must make sure they get these good quality answers so they can get ways to improve on their business. The customers must understand the questions correctly, because if they don?t they could make the answers or just move onto the next question, if every question isn?t answered it will be harder for the NHS and Tesco to determine results from the market research, Tesco and the NHS must make sure that their questions are clear and understandable by checking them so the people answering the questions will have a easy understanding of answering them. The questions in the focus groups must be suitable so the people who are answering must understand them, and they must be related to Tesco or the NHS; the business focus groups must be suitable for people to answer, Also the employee?s from Tesco and the NHS must be there to actually work and collect market research, whereas they could be their to get out of work or help, so Tesco and the NHS must ensure that their employee?s are doing the correct jobs so they can earn their money for collecting market research so they can improve their businesses, rather than wasting time getting paid for nothing. ...read more. IEE-I mainly purchase exterior accessories on a yearly basis. Presently, I have new rims, spoiler, exhaust, angel eyes (lights in the shape of eyes) and windows tinted. I don't really have any interior accessories other than dice. Seasons play a large part on what accessories I purchase. For example, during the winter I will purchase a scrapper, de-iced spray and special winter tyres. If they go bankrupt they will all have to pay the creditors. * Shared decision making - the decision making is the same as shared liability, it's not up to one person, but the whole business will have to make the decision and think of what to do. at this program as a marketing sales promotion program, but we've looked at the program as a way of learning about how consumers shop, and what they want from their retailer, and therefore, not just changing the one to one communication with the customer, but changing the physical retail offer" - (Clive Humby, Scoring Points). Benchmarking is a process used in management and particularly strategic management, in which organizations evaluate various aspects of their company's status. This then allows organizations to develop plans on how to improve their business, usually with the aim of increasing performance. Coca Cola has to make sure that when selling their products that they are fair and honest about their product. This would mean that there are not additional charges to the price or any additional ingredients to the product that are not good for the health of the consumers. Diversification: Apple has not diversified with their products however Apple has a much more diverse product line now than it had a decade ago. This could have lead to a certain lack of focus, but is hasn?t. Apple may be called many things, but unfocused isn?t one of them.